I'm hardly a Kate Hudson fan, but the gorgeous cover had me excited. Is it telling how embarrassingly short her interview is? Maybe not a lot going on in that gorgeous head? Certainly not a single quote even worth the ink. Thankfully, the Murakami interview is much longer (with more photos?). Clogs! I have been dreaming of them for a few years, but can never seem to pull the trigger. These Chloe ones are the perfect shade, but I think I would prefer a mushroom suede with maybe no studs? It's a nice pink, but my first thought was Beadazzled Gunshot Wound. 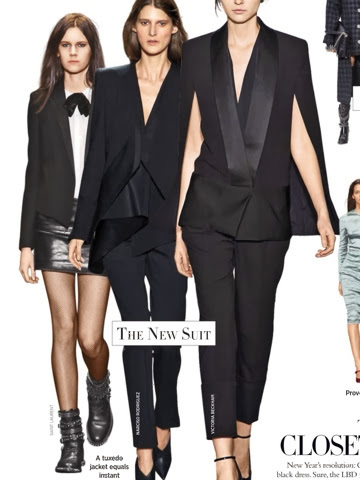 Oh, Victoria Beckham, everything I own for that Tuxedo/Cape! Will write more soon. Life has been a little upside down - ripping apart a new house, picking out tile, paints, cabinets. I'll share some of that soon too.